The conclusion of Drew Faust’s presidency coincides with Michael D. Smith’s announced departure from the Faculty of Arts and Sciences (FAS) deanship. Faust and Smith, like Neil L. Rudenstine and Jeremy R. Knowles, held their offices for the duration of a Harvard administration—in this case, since 2007. Though the interactions between Mass Hall and University Hall can at times seem more distant than their short physical separation implies, having a harmonious relationship (as this one certainly seems to have been) makes life within Harvard easier. Faust was warm and generous in describing Smith’s tenure at the April 3 faculty meeting, the first following the news that he would step down. Nodding toward the financial avalanche that crashed down on FAS in 2008 (and the constraints that have remained since), she said he had led the faculty with a steady hand, and cited in particular his devotion to teaching and to diversity and opportunity for all. During the ensuing standing O, Smith, who is indeed steady and can even seem impassive, beamed and touched his hand to his heart before thanking all present and acknowledging the “incredible honor to serve this faculty” and to join in their work on behalf of students. Before the meeting, president-elect Lawrence S. Bacow had already organized a search for Smith’s successor. There will be plenty for the new FAS dean to do: effecting the move of half of the engineers and applied scientists into their new home in Allston in 2020, ironing out the accompanying logistical kinks—and figuring out how to pay to operate the place; identifying the new (likely scientific) uses for the Cambridge quarters those traveling faculty members leave behind, and ditto on financing the required retrofits; establishing a permanent academic footing, and forward trajectory, for the undergraduate performing-arts concentration, research programs in data science and inequality, and other initiatives; et cetera. One critical piece of unfinished business relates squarely to Smith’s interest in teaching and learning, and the faculty’s obligation to deliver on same: populating the new General Education courses, and launching the program successfully for undergraduates in 2019. The faculty’s review of this part of the curriculum, concluded in 2016, found that it was a mess, and advanced a new and presumably more focused architecture for its future. In effect that means that Gen Ed was subjected to reconsideration under former president Lawrence H. Summers; legislated during the interim tenure of Derek C. Bok; implemented under financial duress in the Faust years; and now is scheduled to relaunch in the second year of the Bacow administration—15 years-plus during which apparently no one believes a significant, mandated part of students’ course of study has been up to snuff. In a letter to colleagues at the beginning of the academic year just ended, Smith observed that the faculty had debated the what and the how of Gen Ed 2.0 (“to prepare students for meaningful lives of civic and ethical engagement in an ever changing world” via single requirements in four newly designated areas, plus exposure to a “quantitative facility” course, to be defined, and three distribution courses). What was lacking, he said, was any articulation of why. Done right, that might result in classes that students actually care about, and a basis for Gen Ed that could, one hopes, outlast the present moment. 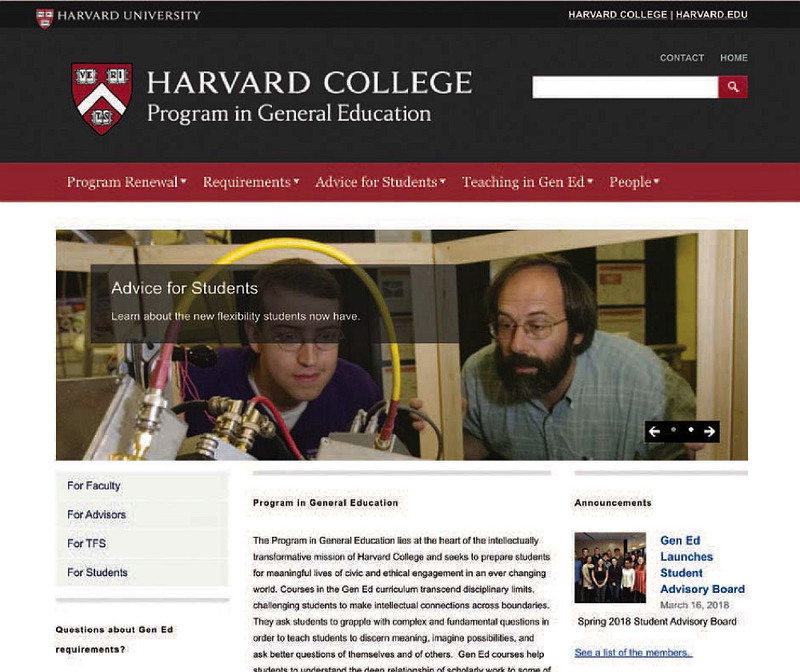 Arriving there will remain challenging: faculty members have to enlist and deliver; students have to perceive the change; and there is the enduring structural problem that FAS and Harvard are culturally inhospitable to a required core of specified courses—or even a defined set of skills that students are expected to acquire. Smith has been recruiting possible teachers for the new courses. Professor of psychology Jason P. Mitchell, the newish faculty chair of the committee that oversees Gen Ed, is pursuing the mission with fresh energy, and refining the why in a way he hopes colleagues will embrace and bring into classrooms. The newly appointed dean of undergraduate education, Zemurray Stone Radcliffe professor of English Amanda Claybaugh , will also have things to say about the execution of these plans. Smith himself will not be in office come August 2019, when Gen Ed 2.0 debuts. But how it plays out will become an important element in determining his legacy. From students’ perspective, it is past time that the faculty get this right.